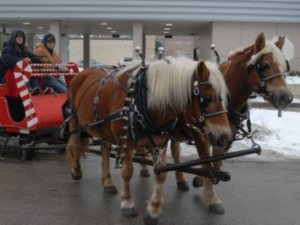 Experience the magic of the holiday season with old-fashioned sleigh rides, ice sculptures and Santa Claus on Saturday, Dec. 16 from 11 a.m. to 2 p.m. This popular annual event takes place near the Prairie Path Gazebo and Spring Road. All of us at Elmhurst Toyota encourage you to bring your family out for this fun-filled event. There’s nothing else like it! Local businesses sponsor the incredible ice sculptures on display at Sleigh Rides, Ice Sculptures and Santa. Warm up with hot chocolate and cookies as you listen to the jingling bells on the horse-drawn sleigh (or wagon if there’s no snow that day). Check out the festively decorated shops along Spring Road. They’re sure to have lots of items that make great last-minute gifts. And of course, Santa Claus himself will be there. He’ll arrive at the gazebo to take photos with children. If you’ve never seen how an ice sculpture is created, you’re in for a treat. The ice sculptor is in attendance this year, demonstrating how he transforms a huge block of ice into a dazzling holiday masterpiece. Depending on the intricacy of the design, he may use tools that include a chainsaw, chisel, hand saw and even a blow dryer. Bring your camera, because these sculptures only last for a limited time, depending on the weather. But that’s all part of their beauty; you’ll see a work of art that was created for your enjoyment before it disappears forever. Stop by this special event, which is brought to you by the Spring Road Business Association. Saturday, Dec. 16, 2017, 11 a.m. to 2 p.m. Contact Spring Street Business Association www.springroad.com.